The stock market has been setting new records over the past 6 months. Donald Trump has promptly taken credit for the new stock market highs, but many investors are rejecting the idea that the president is primarily responsible for these new highs. At least temporarily, Donald Trump has helped move the market up through the promotion of his new tax plan because all American businesses would love to see a cut in their corporate tax rate. Even though Donald Trump has promoted corporate America thus far, investors believe that the driving factor behind the stock market’s recent and past successes is earnings. 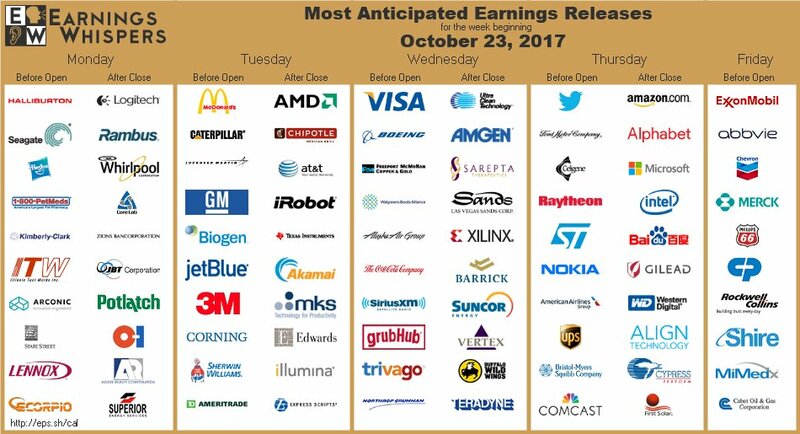 This week, October 23-28, has one of the most anticipated earnings report all Q3. Companies such as McDonald’s, AMD, GM, Visa, and many others (see chart above) are releasing their earnings reports. If companies outperform their earnings report, which they are expected to do, the stock market should rally to new heights. However, in recent history, companies have beaten their earnings have seen stock values decrease A prime example is Costco (COST). When Costco released that they had beaten their expected earnings, the stock plummeted over 7% in one day. The reason was not because of their earnings, but rather the one company that looms over all brick & mortar stores — Amazon (AMZN). Earnings are not the only thing that help or hurt stocks: what investors see as problems in the future is influential as well.